Excellent sound. I don't have an original, but I'm a fan of this release. As another has pointed out, it has nice clarity, but is a bit thin. For the price though, well worth it. what is in the liner notes of these breakout cds? curious! The sound is excellent on this release. Great low end, nice clarity, things could've been a bit more dynamic, sounds a little thin and a tad compressed at times but otherwise great overall sound, nice detail. Nice clean, quiet pressing for a more than fair price. Happy with it. Standout track for me would be "Because Youre Young," they nailed the drums and bass on that cut and it sound pretty spectacular. Amazing effort and especially great on Vinyl! By 1980, Bowie managed to combine the experimental spirit of his acclaimed Berlin trilogy with the FM appeal of the Let's Dance-era and crafted a transcendental album appealing to all sorts of Bowie fans, be it the Zigggy-heads, be it the ambients, be it the dancers. 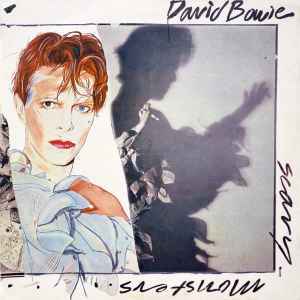 Not his greatest effort (that'd be Station to Station or Lodger), but very close behind and nonetheless a five-star album. Should this not be Europe rather than US, the same as the other three releases on the same day? I have been incessantly listening to this album on Spotify lately. The LP version is far more menacing and invasive than the digital copy. Surreal layering and Doppler tricks abound creating a spatial paranoia that I didn't get with the digital version. There are anecdotal stories of how Saturday Night Live founder, Lorne Michaels, spiraled out on a several month long extramarital cocaine bender while listening to nothing but this album. After finally getting it on vinyl, the story finally makes sense. A new repress is coming out on February 23 and that was remastered in 2017, and it will be on a 2 disc LP, so not sure if it will be better than the original. For me ashes to ashes remains the most emotional, beautiful song , that bowie did in his long carrier. This pressing sounds odd to me - or my setup is suddenly out. It's clean, and a nice pressing (very little distortion except at perhaps the last 20 seconds of the end of one side), but the bass and mids are distant and recessed throughout, leaving quite a hollow sound. Anyone else got this - any thoughts?